How are you guys?? Been quite lazy last month, idk whats going on, but i was super tired all day, not in the mood to do anything, didnt want to get out from bed...Oh well, actually still do till now, plus im sick, 2 weeks already with this cough and flu. I really want to disappear or just stay in the sea for like hours to gain my mood back. But...im trying to get a life now (a.k.a back to blogging, do review, and doing thesis of course). Wish me luck! Sorry for a quite long chit chat, now back to business! 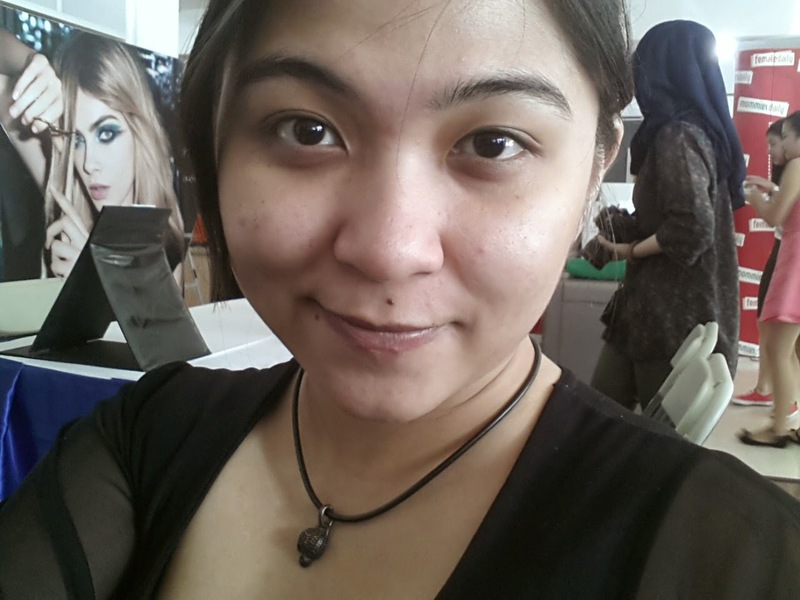 Anyway, i want to post last Saturday beauty workshop that i attended. 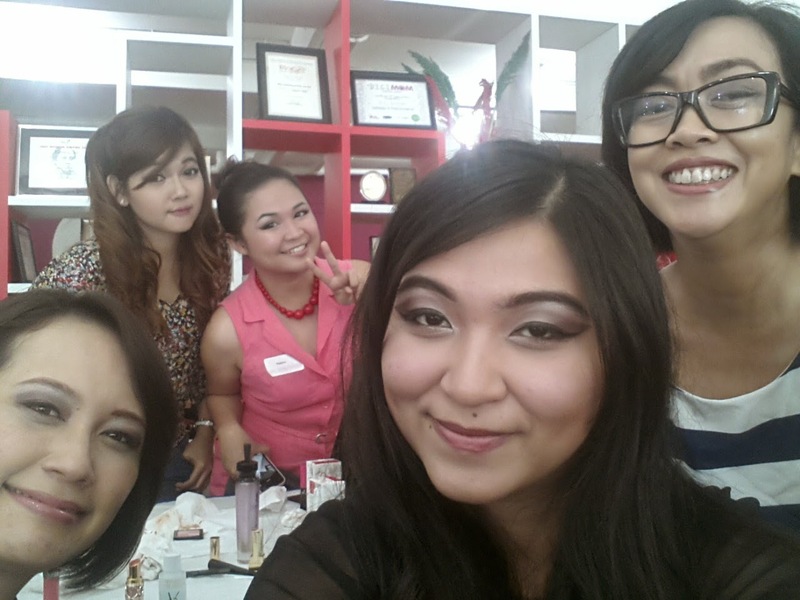 It was Female Daily Beauty Workshop featuring Yves Saint Laurent with their newest eyeshadow, the couture palette! Anyway the design of this couture palette is inspired by Mondrian Dress, also from YSL in the 1960's. It has 5 different colors in each of the palette. Well let's just check out the palette here! So this is the Mondrian Dress, in case you didn't know. Seeeeeeeeeee! All of them are beautifuuuuullll! Me want them allllll! But i cant even afford one! Hahaha i mean it's over my budget and i dont really want to save money to buy this. But i wouldnt mind to get one, or two, or eleven, for free, anyone? Hahaha. Luck, please be with me. Lol! 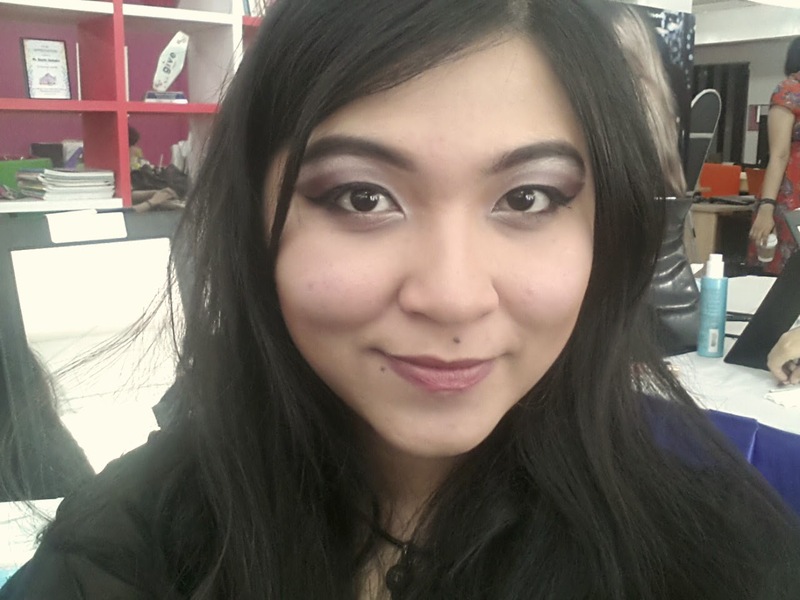 Oh, plus they pigmented nicely, not powdery and stay long (seriously, it stayed like 12hr). That's why, i wouldnt mind to get it for free. (Please, anyone???) Hahhaa. Okay, now let's get to the beauty workshop! 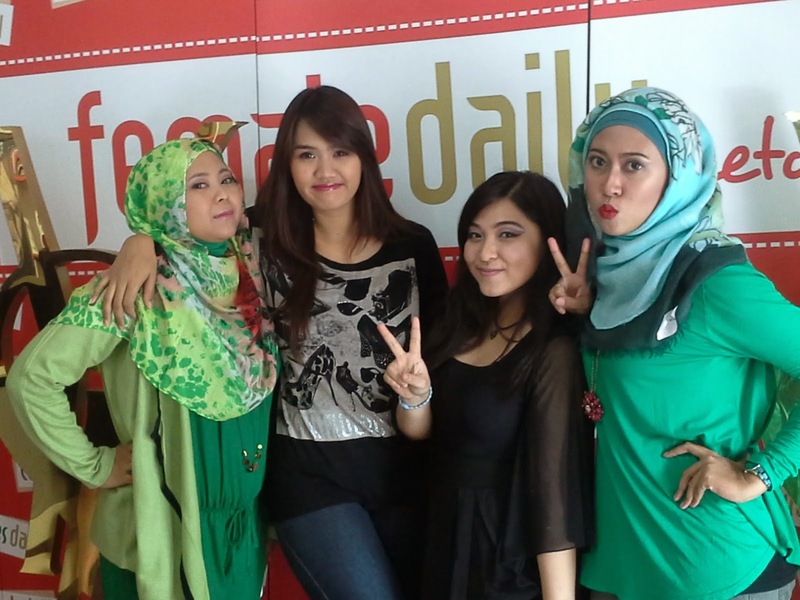 So, it was morning, at about 10am on Female Daily base at Kemang . That was my first time to visit FD office. Since, seriously im not that kind of person who love to stroll at Kemang street, which is very crowded and often jammed by the traffic. I came with my bf, at first i wanted him to take picture of me while doing the makeup, but he was so shy that he choose just to stay at the car. Oh well. When i arrived, the room was almost full by participant, but the event hasn't started yet. Luckily, they offered snacks and drink, like coffee break, so i could fill up my empty stomach! About 20mins or so after i arrived the event was finally starting! I sat on the back table with three other ladies, which at first felt a bit awkward since no one start a conversation, hahhaa. Im shy actually, im not good at starting a conversation, but after a few minutes i tried to be brave and asked their name. Phew! It was awkward at first but as the event goes by, we became the most noisy group ever! Hahaha. Seriously people thought that we were already friends before the event. Anyway, the ladies i met were Namira, Lova, and Yudith. They're lovely and super nice! Some snacks and drinks, yumm! Here's the couture palette that my table got, it was number 7. It may look a bit brown here, but it actually more to purple shade. Some other products, lipstick, makeup remover, lipgloss and else. 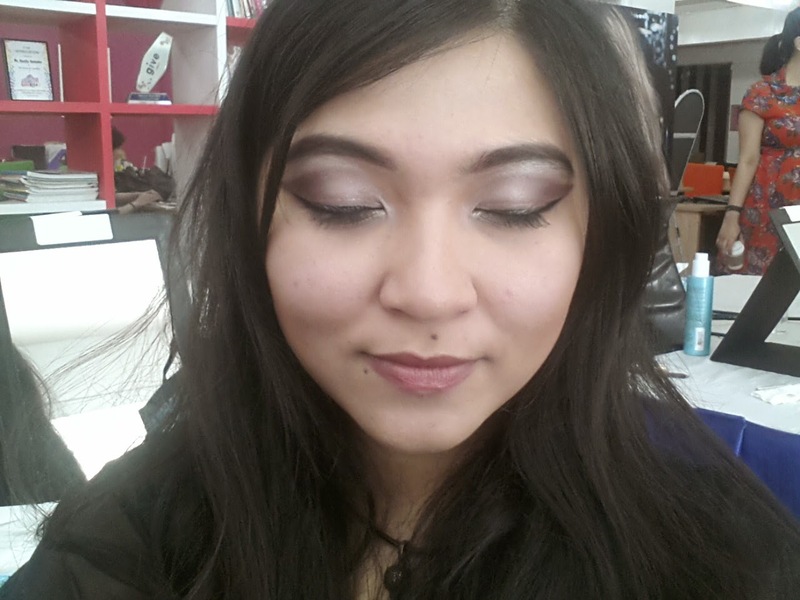 Tadaaaa, after the makeup using couture palette and other products from YSL! Tadaaaahh.. it's a bit purple-brown shade, weird, but i like the color. We surely wont forgot to take a picture together! Four of us in action! Last but not least, my picture with Mba Hani. She's very sweet! I told this incase you ask me why i didnt post any goodie bag picture like i usually do. Hahaha. Quite a lost, but oh well, it's just sample (but it still YSL sampleeee hahhahaha). Not my luck! 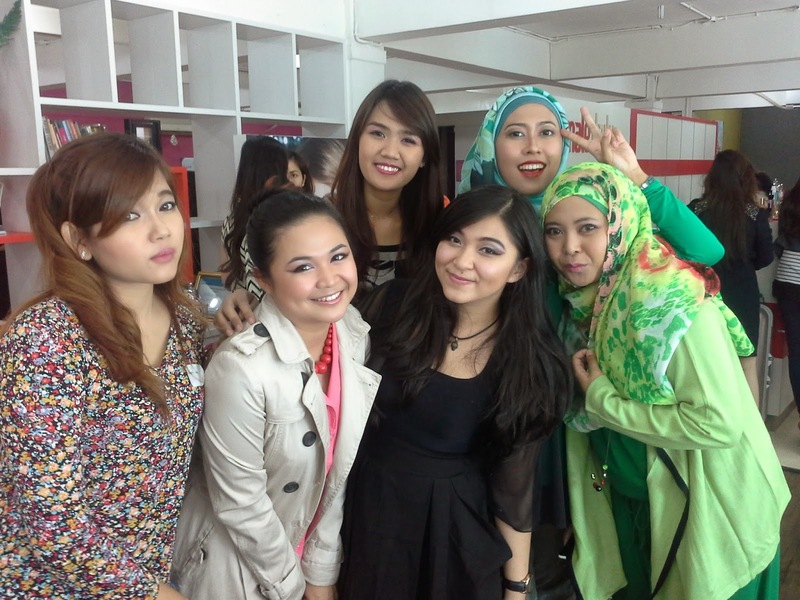 Hehe..
Thats my Female Daily beauty workshop ft Yves Saint Laurent experience, i hope you guys enjoy! Why and how i became a beauty blogger!